Thank you for your interest regarding hte possibility of serving as an Ambassador of Hope. Our Ambassadors are individuals who are committed to helping furthure the ministry of Living Hope from right where they live. 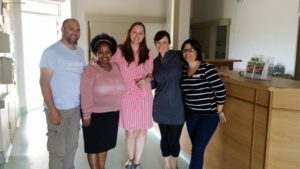 They are individuals who are passionate about supporting the vision and mission of Living Hope and want to work to help advance those efforts. On Friday the 17th March at about 2:15pm, Mr Mveliso Majenge a 21 year old Agricultural student from Living Hope NGO, drowned at Silvermine Nature Reserve Dam. Mveliso was from the Mount Frere area of the Eastern Cape. He was a trainee farmer in Living Hope’s “Harvest Training Initiative” programme. The students were celebrating the completion of Phase 1 of their training by having a hike and lunch at the Silvermine Nature Reserve. After lunch several of the students, who were familiar with swimming got into the dam to swim. Mveliso joined them. Suddenly some of the students became aware of him being in trouble. He had waded into water that was not deep and then suddenly fell into waters which had a steep drop off, which could not be seen. He disappeared in the dark cold water and resurfaced momentarily, putting up his left hand, signaling for help and then disappeared under the water and did not re-surface. Those in the vicinity immediately began to search and others joined them. After 8 – 10 minutes of searching his body was found. CPR was immediately commenced and continued until the arrival of paramedics from Cape Medical Response (CMR) who took over the resuscitation efforts and established a heart beat which was relatively stable. Although the Emergency Services helicopter arrived, it was decided to rather transport him via ambulance to Groote Schuur hospital where he was admitted and to attended to. He sadly passed away at about 8:20pm. John V Thomas, Chairperson and Media spokesperson for Living Hope who was on the scene about 20 minutes after the incident took place said that the team that was present did all they could in immediately calling for professional help and in finding his body and initiating resuscitation and continuing CPR until paramedics arrived. The family in the Eastern Cape was informed as soon as possible and Living Hope remains in constant contact with them. We extend our sincere condolences to the family and all those affected by this tragedy, says Thomas. We are all grieving the loss of this wonderful young man. A full investigation into this tragedy is in process and fellow students and staff members who have been traumatized by the incident attended a 2.5 hour trauma debriefing session with a Counseling Psychologist and have also had support from Living Hope’s chaplain. Further help and support is available to them on an individual basis or in a group setting. 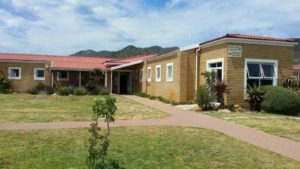 A Memorial service is being arranged for the students and staff of Living Hope and will be held at Living Hope’s campus, Kommetjie Rd, Capri on Thursday 23rd March at 13:00. Thomas added ‘Living Hope extends it thanks to all those involved in the rescue effort, in particular CMR for their outstanding efforts in resuscitation and to all who came in support and help – National Parks, EMS paramedics, police, fire officials and others as well as to Lovedale College in Alice’. Funeral arrangements are being made by his family in the Eastern Cape and will be communicated once final arrangements have been made. Every year in March we host our Annual Open Day and Family Easter Egg hunt, this year will be our 3rd year and we are so excited as numbers of visitors on the day grow each year as more and more of the community come out on the day to see who we are and what we are about. The children of the valley have had great fun in participating in our Family Easter Egg Hunt where they find the Easter Bunny and visit the nests filled with Easter Eggs. There are lots of activities planned from jumping castles, facepainting to food stalls and information talks on TB and Drug Awareness to meeting some of the amazing staff involved in our 23 programmes. 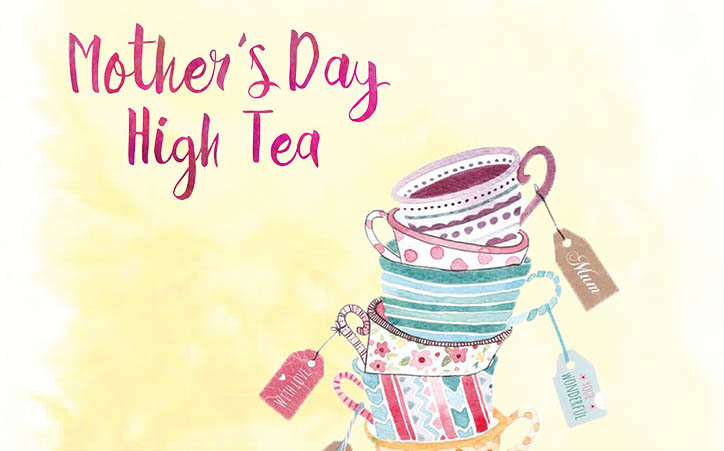 Bring the family and enjoy the morning as we share what we do and who we are! Shop on Amazon and benefit Living Hope!!! Did you know you can Shop on Amazon and benefit Living Hope? Partners Conference is going to be different this year. During the course of the year, John Thomas, our founder and current chairman is hopig o visit all our partners in America. 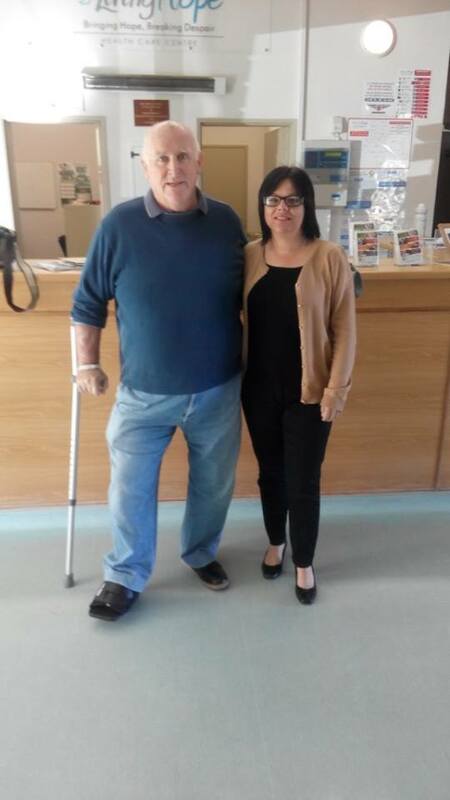 John will bring a one and half hour interactive presentation of LIving Hope with him and is happ to meet with people on their own or in a group. Here in South Africa, temperatures are rising in a number of ways, but the hottest news to share with you, is that we are most excited about the launching of a Face-a-thon this #GivingTuesday, 29 November!! We want to appeal to you to join us in giving so that we can reach our Face-a-thon goal of $56 003 – which represents the exact number of people whom we served last year! By donating, you are partnering with us in order to care for those who desperately need care! Donations made in South Africa and the USA are tax deductible. Next week we’ll update you with some more info about what we are planning. Like King David showed compassion to we too have many opportunities to show compassion. Click on the arrow below and hear directly from a disabled patient, Terence Vlok, of how Living Hope assisted him while he was a patient and stayed 3 months in the Health Care Centre. 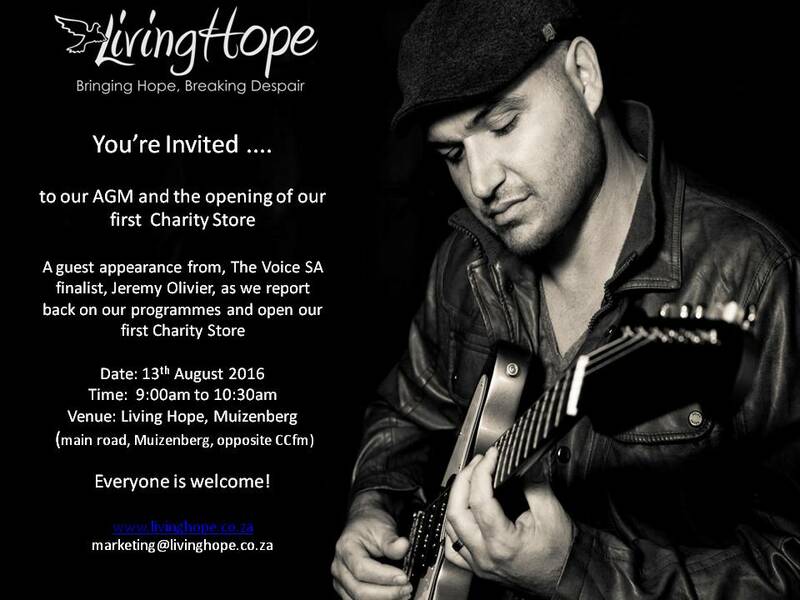 Don’t forget this week Saturday, 13th August 2016, Living Hope invites you to the opening of our first Charity Shop and we have guest artist, Jeremy Olivier, who will be performing live as we also have our AGM and report back on our programmes and what they’ve managed to achieve in the past financial year. 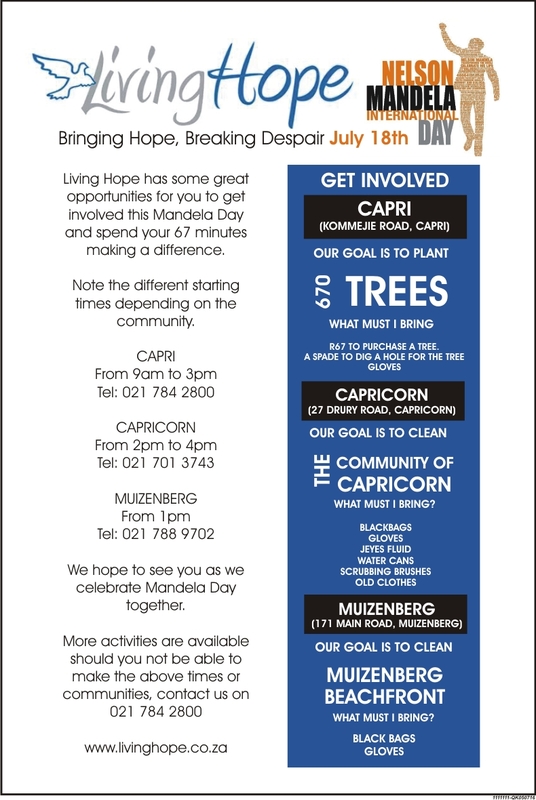 18 July is Mandela Day – a day which South Africans are encouraged to give back 67 minutes of service in one way or another. This brunch and fundraiser supports Living Hope’s Health Care Center, caring for chronically ill persons. Special ncouraging speaker, door prizes and more!